I had the pleasure of watching a show on PBS late last night that I thought at first would be very boring. The subject was pumpkins-and the people who grow them. I have to admit that I was so ignorant about this subject. After all, I don't believe many people give a lot of thought to pumpkins. We just take for granted that they are a part of the fall landscape and have a deep connection with Halloween. What I learned though is that there are folks out there who are extremely dedicated to growing the biggest and best pumpkins ever. These people are so passionate about pumpkins that they devote a great deal of time and effort to their pursuit for about half of each year. Who knew that pumpkins can grow up to 40 pounds in 1 day? One man sacrificed time he could be spending with his family to give that extra attention to his pumpkins. I never knew they were so delicate and required so much time and attention. Like the lady who had one destroyed by a mouse that had eaten into it. She went out and bought hundreds of mouse traps because she was determined not to lose her prize pumpkin to mice. She then proceeded to surround the plant with traps layered three-deep in order to protect her pumpkin. This show was very enlightening. I find it interesting, ctry, that some people devote their lives to accomplishing something like growing the largest possible pumpkin! One man even said that he will sometimes sit on his porch and "watch" his pumpkins growing, lol. That sounds very interesting. 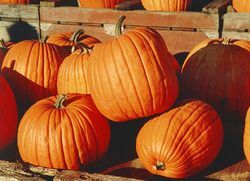 I didn't know that people spend so much time trying to get larger than normal pumpkins either until my daughters and I studied pumpkins in school the other day. It was amazing to see how dedicated people are to these pumpkins. Yes, carolscash, we take so many things for granted, never understanding just how much time and effort are devoted to the finished product. I wanted to grow some pumpkins this year but I had to move so I couldn't plant them. I love cooking with them when they are in season and it would be lovely to see if they taste any better than the shop bought ones. 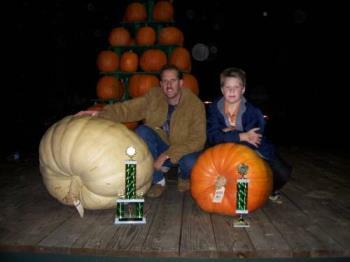 I've seen shows about people who grow the huge ones it was about a man and his 2 sons. It was great to see a family all working together enthusiastically and having fun.